This new, 2010 Chinese 3/4 size bass bow for sale is made of woven carbon fiber; there is no maker or name stamped on the stick. Because the carbon fiber is woven, it makes a stronger stick than a regular carbon fiber bow and accordingly performs in a superior manner. The stick is round and has a German-style ebony frog. The 3/4 Chinese Carbon Bass Bow plays smoothly and gives the bassist more control over the sound of the instrument than an entry-level brazilwood bow. 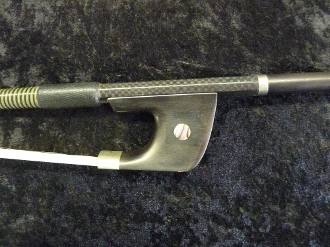 Priced at $170.00, an aspiring bass player would enjoy playing with this bow.